The old tradtion of no one seeing the bride until she walks down the aisle, is giving way to something better. It’s called the FIRST LOOK. It happens a few minutes before the ceremony begins. Basically, the bride and/or groom see each other. Often the photographer is there also to the capture reaction of each of them as the see each other for the first time on their wedding day. FIRST LOOK is done in several ways. The first isn’t really a “look.” The bride stands on one side of the door and places her hand around to the other side where her groom awaits. They just hold hands, share a few words of love and support but don’t actually see each other. Another way to do this in an outdoor wedding where there are no doors is for the groom to be blind folded as he bride reaches out to hold his hand and to share a few private moments. The more common FIRST LOOK actually takes place when the bride and groom meet alone togethe-the two of them. In these moments they can share their delight in what they see-the beauty, the radiance and the love they see in each other. They talk. They hug. And yes, they often kiss. It’s their last kiss as single people. It’s a wonderful, intimate moment for two people who won’t be alone again until late that night. The couple often invites the photographer to their FIRST LOOK but not anyone else. Here’s why FIRST LOOK is a great idea. First it is a great stress reducer. The groom is not stunned or shocked when he sees someone walk down the aisle who looks amazing but who isn’t the girl who ran on the beach with him to day before. With the FIRST LOOK, he is able to see and process all the changes he sees in his bride and to enjoy them. Then when she walks down the aisle as their wedding begins he can enjoy the amazing beauty of the woman he is about to marry. Second, the FIRST LOOK gives the bride and groom a time to encourage and support each other in the middle of all the pressure of a wedding day. It’s a moment for just the “two of us” to tell a story, share a laugh or just hold each other. There have been so many things for both of them to “worry about” in the time before the wedding. Now it’s no worries. It’s just being together before the ceremony and the reception. FIRST LOOK is also great for your guests. You can get LOTS of photographs of the two of you together in all the splendor of your wedding ensembles before the wedding. That way you can join the reception that much sooner. Your guests came to be with you, to love you and to share your day. The shorter the time they wait for your “grand entrance,” the more excited they will be. 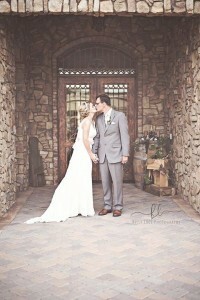 Long photo session between a ceremony and a reception are hard on your guests.